QuasarDragon: Fresh Free Reads! Get 'em While They're Hot! Fresh Free Reads! Get 'em While They're Hot! • "Shadows of Dargon" by James Neale. Fantasy. "Jem shifted slightly, moving his shoulders along the wall, so that his relaxed slouch allowed him to watch the man swagger down the street. He had felt the welling shock of hope, when he first glimpsed the man stalking through the crowd. He had thought it was Rauf, but it was not. Jem still hoped Rauf would walk back into his life, like he had that cold winter night five years ago." • "Ol Tamboch Narhin - The Rigors of War" Part 5 of 5 by Dafydd Cyhoeddwr. Fantasy. "A country often has a characteristic for which it is known, such as Lederian wine, or Mandrakan marble. At times, opinions vary on the defining feature: Comarr is best known to some for it tobacco, to others for its cattle. Sometimes, though, the opinion is universal. Such it is with the Beinison Empire. The characteristic for which it is best known is war." • At Fireside Fiction: "Form and Void" by Elizabeth Bear. Science Fiction. "But Comanche knew that if she didn’t say, “I’m emigrating to Io too,” that would be the biggest, shiniest ruby of all. So Comanche kissed her mother goodbye, and kissed her father, and packed up her few worldly things." • At HiLobrow: "Herland - Part 9" by Charlotte Perkins Gilman.Science Fiction. 1915. "To these women we came, filled with the ideas, convictions, traditions, of our culture, and undertook to rouse in them the emotions which — to us — seemed proper." Lilith by Kaden Brown. Fantasy. One Bite Leads To Another by Kelly Steel. Vampire Romance. Beloved Enemy by Janet Miller. Space Opera. O Human Child by Walter Donway. Dark Life, Bright Death by Judy Colella. Science Fiction. The Knightmare by Deborah Valentine. Time Travel Romance. Ariel's Dream by Tahlia Newland. YA Urban Fantasy. John William and the Bandits of Basswood by Elizabeth Parkinson Bellows. Children's Fantasy. Whom the Gods Love by M.M. Perry. Fantasy. The Witches of Merribay by B.J. Smash. YA Fantasy. Caleb-Seven by James Andrew Wilson. Science Fiction. Child of the Sword, Book 1 of The Gods Within by L. Doty. Fantasy.YA Fantasy. Easy Bake Coven by Liz Schulte. Paranormal Romance. Ella Awakened by S.E. Duncan. Paranormal Romance. Black -- Canto I of The Nephilim Codex by Charles Colyott. Paranormal Romance. Wingling (Ellery Rider) by Megan McCabe. Fantasy. I Am A Demon by Rory Clark. Horror. The Wild Man (The Wild Lands) by Joe Darris. Science Fiction. The Dragon's Portal (Dragon Portal 1) by Sally Slayer. YA Paranormal. 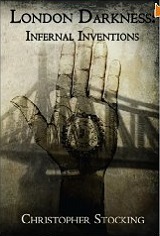 London Darkness: Infernal Inventions by Christopher Stocking. Steampunk.